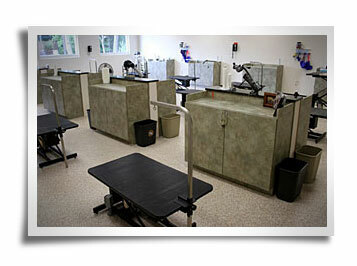 Thank you for inquiring about the Virginia School of Pet Grooming. This information is designed to give you an idea of what we offer the person who is thinking of making professional pet grooming a career. We are very proud of our facility and our course structure. We invite you to make an appointment to come by for a tour to get acquainted with us and to answer any questions you may have in more detail. We do not have group classes. Our program is set up for a more individualized training practice. This allows maximum attention to each student from each instructor. This also gives you the flexibility to schedule class days to your personnel needs. Come full time or if you need to have a part time job to keep things going at home set up a part time class schedule. We are certified to operate through the State Council of Higher Education for Virginia. If what you read interests you, let us know. We think that you will be pleased with what you see and hear. Hope to see you soon.